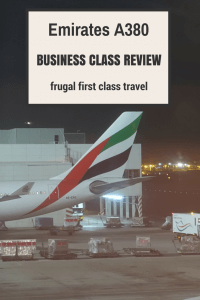 You are here: Home / Dream / Business Class Airline Reviews / Emirates versus Etihad: which business class is better? Hi Frugalistas! 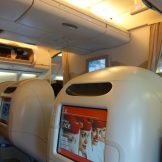 On my trip to Athens last October I was fortunate to fly in two of the world’s most highly regarded Business Classes: Emirates and Etihad. 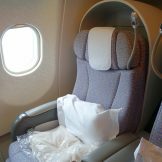 Flying Etihad Business Class from Sydney to Athens, then Emirates Business Class Athens to Sydney gave me the perfect opportunity to compare these two airlines’ business class offerings. 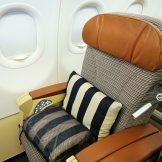 When I compared Emirates First Class and Etihad First Class I gave it to Etihad (just). So which airline does Business Class better? 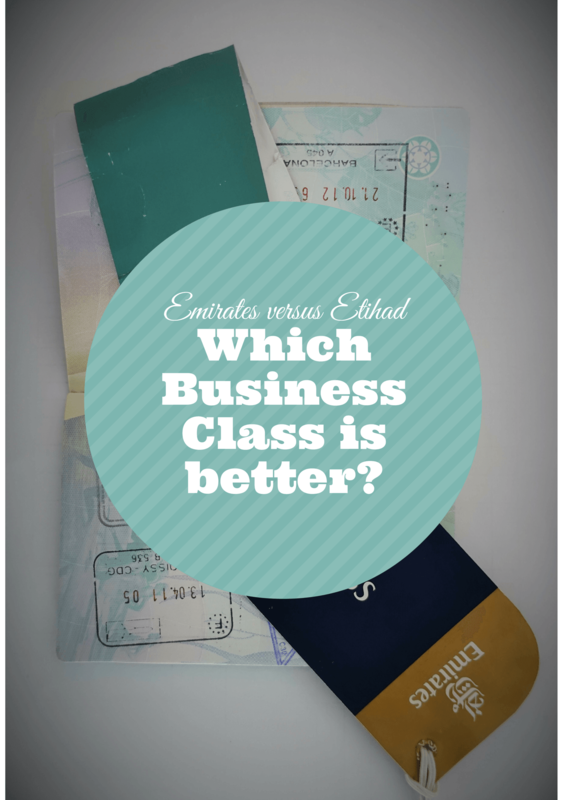 4 Emirates versus Etihad: which business class is better? I’ve decided not to compare the lounges at departure points. Etihad has its own lounge in Sydney, whereas Emirates uses a commercial lounge in Athens. It’s not a fair comparison, and is more reflective of the size of the market in each city, rather than the airline. However, the home ports of Abu Dhabi (Etihad) and Dubai (Emirates) are definitely up for comparison. 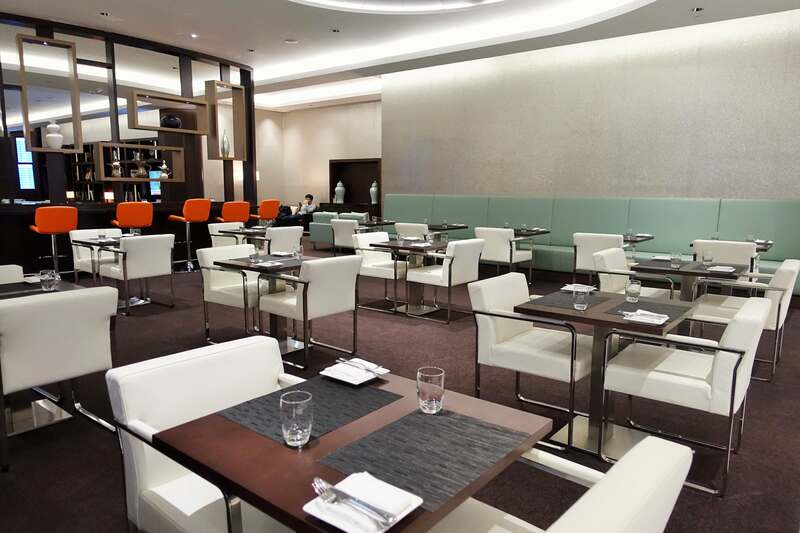 Etihad has just opened a new lounge for First and Business Class passengers in Abu Dhabi. (2017 update: Etihad now has its own dedicated First Class Lounge in Abu Dhabi). It’s a beautiful, bright and spacious lounge. The only downside is its distance from the gates and security screening area for transferring passengers. Plenty of food and drink, lots of seating options whether you want to work or relax, it’s lovely. The Six Senses Spa has moved with the new lounge and continues to offer a wide choice of free 15minute treatments. My eye treatment is both refreshing and relaxing – just the thing after a 14hour flight! Wifi is easily accessed and fast. 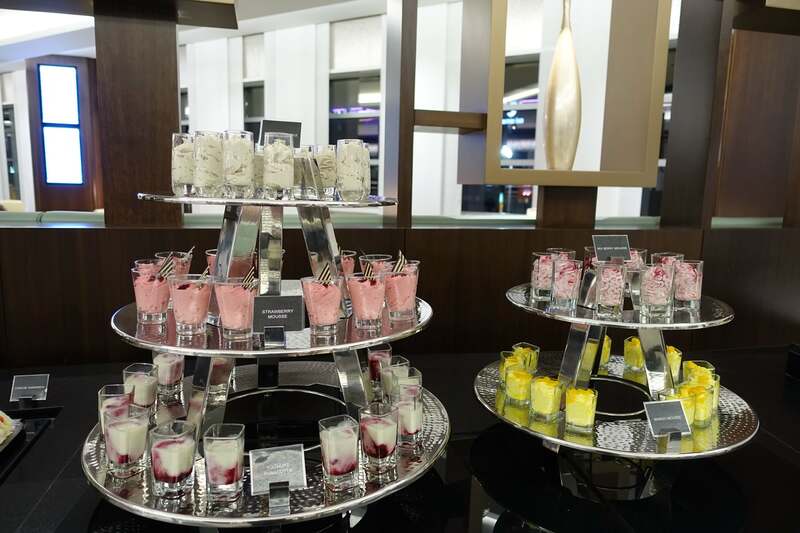 My friend Sharon from Simpler and Smarter, found the Etihad lounge was also perfect if you are travelling with kids. She was impressed with the nannies available in the lounge who went out of their way to look after her baby when she was in transit here. Like its First Class friend, the Emirates Business Class Lounge in Dubai is dark and noisy. While the lounge itself is quite empty when I’m there, noise from the noisy main concourse below filters up to the mezzanine style lounge. And I can’t come to grips with the gloom of the lighting. 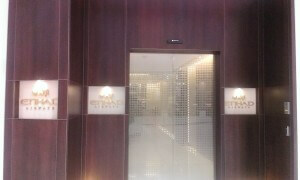 In October when I visited, the lounge was undergoing renovations and the Spa was closed. Dining is at the rear of the lounge and had a very institutional cafeteria feel to it. The choice of food looked a bit limited (I didn’t eat). Wifi was great, and I particularly appreciated the phone charging station (which Etihad doesn’t have). But I do think the Etihad Abu Dhabi lounge is superior to the Emirates Business Class Lounge in Dubai. As with First Class, I also find the service and food in Etihad Business Class better than Emirates. 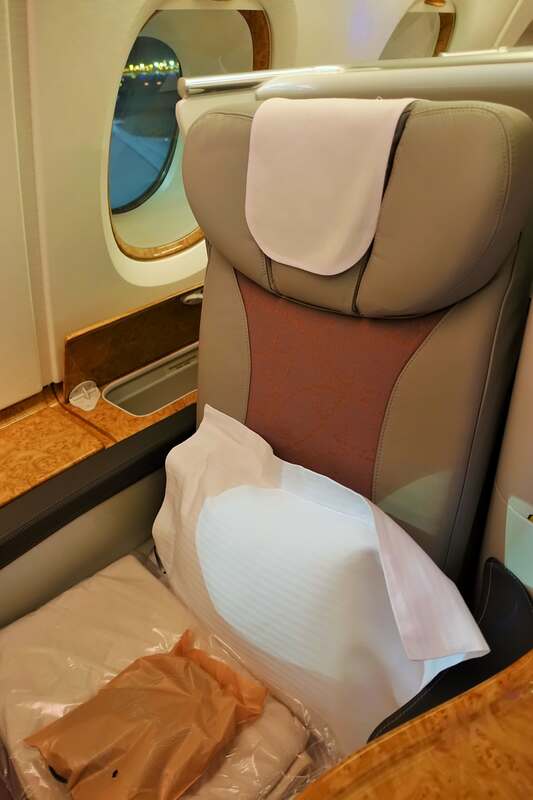 Again, as with First Class, it’s not that Emirates is bad – Etihad is just better. With more personal and frequent attention, and true restaurant style food, I’m a huge fan of Etihad food and service. As I wrote in my earlier review of Emirates Business Class, a chicken and rice dish was very ordinary. 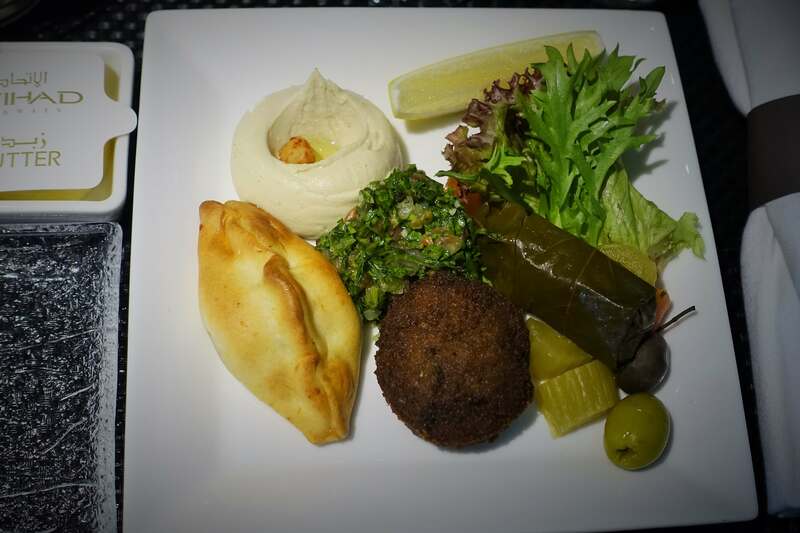 As one would expect, both airlines do a fabulous mezze plate. The Emirates A380 lounge area in Business Class serves a good range of pretty finger foods, but ordinary service lets it down a bit. Both airlines provide short haul seating and amenities between their home ports and Athens, so a good comparison is possible. I hate the Emirates seat. With its modular, bulky design I feel quite claustrophobic and cramped – even though objectively it’s not. The seat itself is hard and uncomfortable. 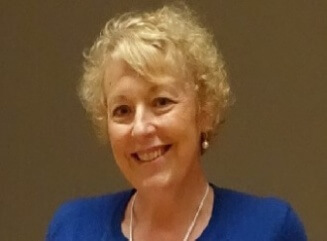 I can’t wait to get off the plane……..The simpler slimline Etihad seat is far more comfortable, is more open, and is easier to get in and out of the window seat. There are three areas where Emirates beats Etihad. 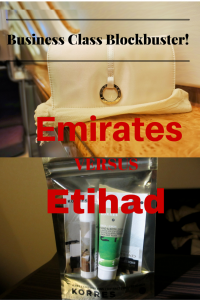 The first is a minor detail: the Bulgari amenities kit offered on Emirates beats the Etihad Korres kit hands down. I don’t know anyone who chooses their airline purely on the basis of the amenities kit, but the Bulgari one is definitely the more luxurious option. The second area is the biggy for me. I love, love, love the Emirates Business Class seat on long haul. 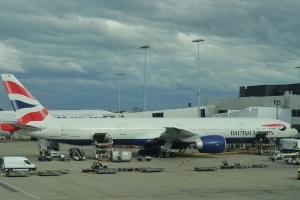 Plenty of storage in the A380 – window seats have the side bins like on an old 747 as well as overhead lockers. Etihad just can’t compete with in seat storage. I also found the Emirates seat more comfortable. In fact I would go so far as to say, that for me, it is more comfortable than the Emirates A380 First Class seat (yes really!). Not as roomy, and certainly not as private – the seating is very open, but definitely more comfortable. Etihad’s seat is comfortable, and on the window seats definitely private like a suite. But I do love the Emirates seat. Thirdly, Emirates’ entertainment system has more choices. It’s almost as though they designed it with the 20+hour flights we Australians endure to go to Europe in mind. Etihad’s system is good, but there’s just not quite as much choice. Express lane passes for Immigration and Customs in Sydney are a given. As you would expect from two premium airlines bathrooms are kept spotless and well stocked (although the A380’s large Business cabin does lead to queues at times). Hhhmm, good question. I think for short haul, I have to give it to Etihad. For me, the Emirates seat was just awful. But for long haul, and probably overall, I think Emirates just wins the day. The seat and the storage is something that Etihad just can’t compete with at present. I’ll be interested to see the Etihad Business Class A380 when it starts flying to Australia later this year. Both Business Classes really are very good, and it is just a personal preference. If I was looking at booking long haul to Europe (Sydney to the Gulf, then long haul to Europe) I’d probably go for Emirates. Short haul (long haul to the Gulf, then short haul to Europe), I’d definitely prefer Etihad unless the Emirates flight was just too cheap to pass up. Neither airline provide pyjamas in business class, so you might want to check out some options for what to wear on long haul flights. You can’t go wrong with either. Book the cheaper, and I’m sure you won’t be disappointed. Author’s note: I used frequent flyer points for my Etihad flights, and paid for my Emirates flights myself. Thanks for your review. I’m an Aussie but Middle East based so frequently need to choose between Emirates and Etihad – and price isn’t the only consideration. Up the back of the plane I still think Emirates has the edge but both sure know how to cater to the pointy end folk, we just need to work in more status points with Emirates! I’ve never flown Economy in either Keri, but have heard that Emirates is better. If you can cash in some points Business Class is definitely the way to go!